Life Changing Memories for Me. TWO ROOSTERS FOR ROOTY BOY . . .
Oh the trials of puppyhood! Of all my dogs, my first shorthair “Upland Rooster,” or “Rooty” for short, was probably the most destructive puppy. He loved to chew on anything and everything from straw hats to hoses. He also had a bad habit of drinking from toilets and—with his dripping jowls— you never knew when you were going to get greased with some slimy unpleasantries. In short, Rooty was a royal pain in the neck at home. Little Rooty points a sage grouse wing tied to a string. Despite his shortcomings, Rooty was a quick learner in the field. The first time I put a dead grouse in his nose, a light turned on and he knew his purpose in life: to find birds. Rooty’s natural ability and drive more than made up for his obnoxious puppy antics. A few hunts in particular stand out like snapshots of Rooty’s glory that I want to share with you. Like most of my dogs, Rooty cut his teeth on valley quail, which, in good years, are perfect for a pup: They are plentiful, they give off plenty of scent, and, in my experience, they hold pretty darn well. 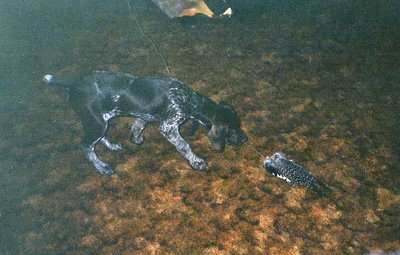 As I wrote about in “Rooty,” which was published in the Pointing Dog Journal, Rooty’s first point and retrieve was on a valley quail. One Saturday morning, Rooty and I were hunting a farm overlooking Kendrick, Idaho. The farm held numerous strips of think cover in between rolling wheat fields and the birds were there aplenty, pheasants, quail, and Huns. As we hunted away from a huge barn that was constructed in the early 1900’s but still in use, up a CRP strip, we approached a berry bush. Rooty’s four-inch stub tail wagged in intensity and Rooty soon locked up with one of his front paws aloft, a text-book point. As I stood off to Rooty’s right side, quail began to come out as singles and each of them took the same line of flight, which presented me the exact same shot six separate times. Can you guess how many times I made the shot? Only twice, but I was pleased as a peach! It was my first full year as a bird hunter and a bird in the bag made up for more than 20 misses. The whole time Rooty stayed steady to wing and shot and made a nice retrieve when the smoke from my barrage cleared. If I recall correctly, the farmer’s wife had a soft spot for quail. Earlier, when I asked for permission to hunt, the farmer told me I could kill all the pheasants I wanted, but not the quail, which was a tough restriction because there were oodles of them on the property. I generally try to respect landowners’ desires when it comes to hunting on their land. However, in the heat of the moment and the intensity of Rooty’s point, I conveniently forgot the farmer’s instruction. The next day at church, I penitently confessed to the farmer that we killed two of his wife’s quail. In response, he laughed, but then sternly told me not to do it again. You know what? If I had it to do over again, I would like to say that I would never do that again, but then I might be lying. I wouldn’t trade that memory with Rooty for anything. In my opinion, a rooster pheasant is one of the hardest birds to pin down with a point and—once they are in the air—to kill cleanly. They require a dog with a good nose, a gunner with deadly accuracy, and, if the bird is only wounded, a good, persistent retriever. Admittedly, my record on wily ringneck pheasants is not too stellar. 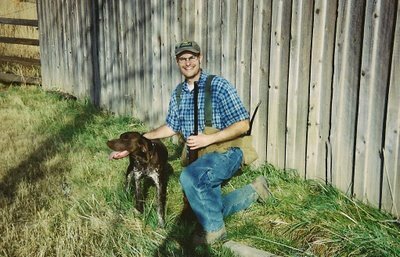 That is why the following memories of pheasant hunting with Rooty really accentuate for me what a great dog Rooty was. One bright fall day after school, I took Rooty to a place not far from Troy, Idaho. The covert consisted of huge CRP fields with a small Christmas tree farm—a pheasant fortress— right off the road, a cattail choked pond nearby, and a brushy draw on the back end: Pheasant City, in anybody’s book. Rooty and I quickly hunted through the Christmas trees down towards the thick draw. As we walked down one of the grassy fingers of the draw, Rooty did the tell-tale dance and stepped into the statuesque pose, leaving no doubts that a bird was present. I stepped forward and a raucous rooster blasted out of the grass with a corkscrew flight. On my first snappy shot, I missed to the left, corrected and the bird crumpled in a halo of feathers on the second shot. The proud hunter and Rooty with our first rooster in the game bag. As I picked up our first rooster, I was in a euphoric state. I have harvested some pretty good deer in my life and my first long-spurred rooster with Rooty was just as thrilling as any trophy buck. As Havilah Babcock, a diehard bird hunter so aptly stated, “I don’t want to shoot an elephant.” With the challenge and variety that wing shooting brings and the bond between man and dog, neither do I. A few weeks later, Rooty and I went back to the anti-quail hunting farm with my friend, Craig Dalton. Again, we hunted the thick buffer strips. As before, Rooty’s body language clearly indicated that a bird was close on the ground, but Rooty had to put up with evasive maneuvering on the pheasant’s part. When the pheasant realized the gig was up, he flushed noisily straightaway almost as if in slow motion. It was one of those shots that seems too easy. When I pulled the trigger, the bird dropped stone dead in the cover and Rooty made a nice retrieve. I was too excited about my pup’s performance and success to respond. While there were other birds harvested with Rooty, these were our only two roosters together. With the current hunting season quickly coming to a close, it seems like it passed in the blink of an eye. Yet, that is all the time that I had with Rooty, one short, glorious hunting season. Rooty had so much promise, but his life was cut short the following February on a nearby highway. As I reflect on his life, I am struck by its simple perfection. Rooty was born to do one thing and he did it well. Our two roosters together are a testament to this fact. But during his brief life, Rooty did something else, he touched my heart and changed my life. Today, I still keep bird dogs, a French Brittany, Sunny, and a new American Brittany, Misty. I am once again putting up with puppy antics largely because of my treasured experiences with my first dog, Rooty Boy. Rooty, I love and miss you buddy! That's a terrific account with a most unfortunate outcome. Still, I really enjoyed reading about Rooty as I too am going through GSP puppy hell. This is my second GSP (I'm not sure I could go with another breed at this point. I'm just so happy with their industrious nature.) and I have to tell you, I have figured one thing out. Puppies that chew, hide and carry shoes, binkies, toys, stuffed animals, tree branches, hub caps, Christmas tree ornaments, an all manner of anything they can fit in their mouths – RETRIEVE. All things considered, I'll take the trade off, although my wife might argue that point. 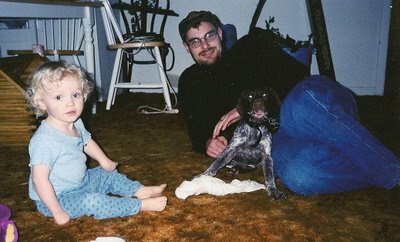 My young "idiot" is one of the best retrieving GSP's I've ever seen, and secretly as dear to me as my kids. It sure is fun when you get that once in a lifetime dog. I'm only ten months in, but believe I'm on that journey. Andy…Great story…thanks for the memories! Rooty was a special bird dog!